Reading: I almost read all the books which were on my Spring Reading List (I´ll do a recap soon). This week, I read two wonderful stories: IF I STAY and WHERE SHE WENT (both by Gayle Forman). The way they were written inspired me to work even harder on my WiP. I read the second one in the train and yep, trying to fight the tears. Again. If you haven’t read them, you should! So, tell me what made you smile this week? Welcome back! 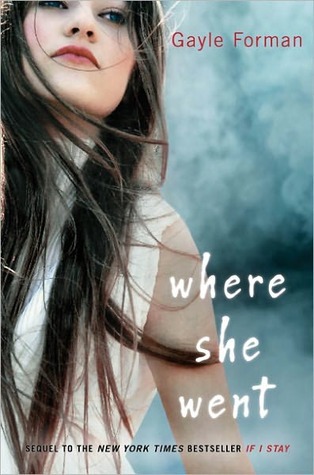 I loved (loved loved loved) IF I STAY, but I haven’t read WHERE SHE WENT yet. It’s been on my list forever, but I think I forgot about it. Time to bump it up. And yay on jogging again! I love jogging, but only if I have pretty scenery. Otherwise it’s so.boring. Running against the Rhine sounds fabulous! Most people would be saying “*Groan*… back to work!” It’s great that you have colleagues that make returning to work something to look forward to! My colleagues are great 😀 And I think that it�s wonderful that you see how much your family makes you happy 😀 Hope you�re having a nice weekend, Colin! 😀 I am glad that a talk with your sister helped you towards a big blowout 😀 Sometimes even if we have all elements, writing that big conflict or its resolution is a tad scary or we don�t see how we can make it happen! Hope you�re having a wonderful weekend, Jaime! I had a pretty rough week, so not much made me smile. However, I did win an ARC of Amelia Anne is Dead and Gone, which I’m excited about! That made me smile. 🙂 I also got an email from someone I hadn’t talked to in awhile, which was nice. I had a great writing week which has made me smile a lot! I haven’t read Where She Went yet because I need to prepare myself first but I looooved If I Stay…mega tears though! Thanks Claire 😀 The trip was really amazing! Sometimes, the brain just goes faster than the feet can 😀 I would love to read about your trip to Asia, did you blog about it at some point? Hope you�re having a great time!